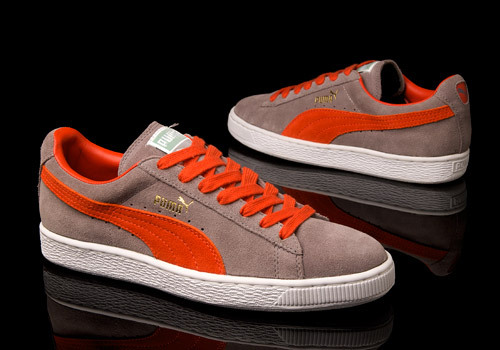 The PUMA Suede; a timeless, classy, and easy to rely upon pair of sneakers that just doesn’t seem to quit. 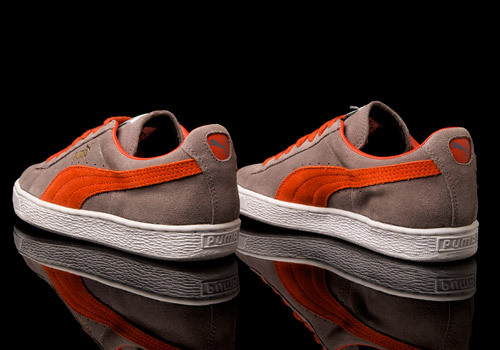 Not now, and not back then, in 2004 when these “cinder” brown and “orange.com” beauties were released. I love basketball shoes. I truly do. But I’ll quickly admit that I’m no Suede savorer. I think the closest I came was the “ermine” Solebox States I snagged in early 2013. And those I don’t really rock, because, in reality, I’m all about the high tops when it comes to hoop shoes. However I can certainly appreciate the aesthetic of such a serious sneaker artifact. 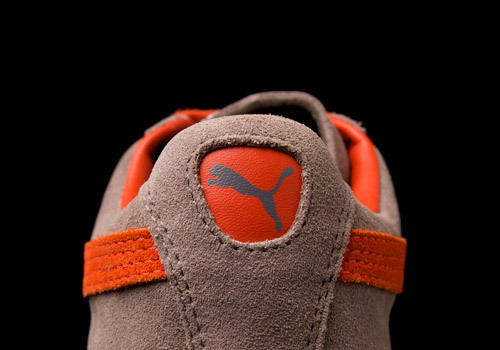 And what I love the most about the Suede is how PUMA treats it. 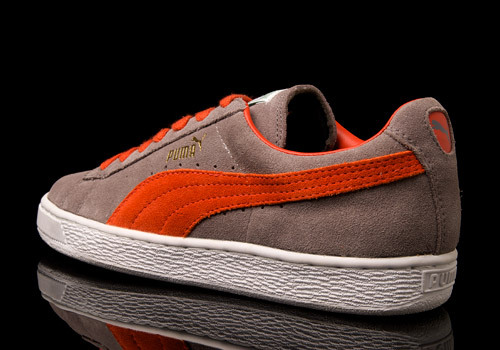 Especially these days with all the exciting (and sometimes very disappointing) retro versions being revived from PUMA (and other brands’) archives, it’s great to almost always see the Suede done in a true, comfortably built, down to earth designed style. 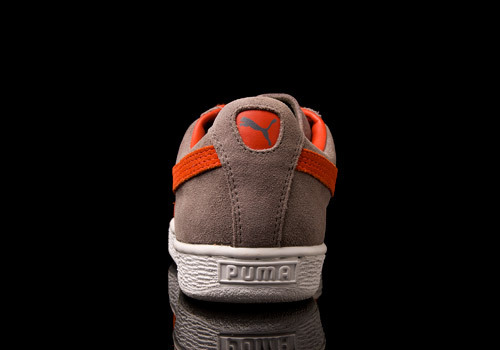 That’s not to say that the Suede never goes experimental or crazy – it certainly has, just check out the Yo! MTV Raps series for one example – and if you look over the years you can see gradual, slight shifts in materials or additional colorways, but really, beyond those little, lovely upgrades, the silhouette stays true, true, true to its original Suede self. Just glancing over the small pocket of Suedes we’ve stocked up here at eatmoreshoes, you can begin with the unknown Taiwan’s, in grey and pink and pink and white, both lovely, and simple, and sweet in their delicacy. 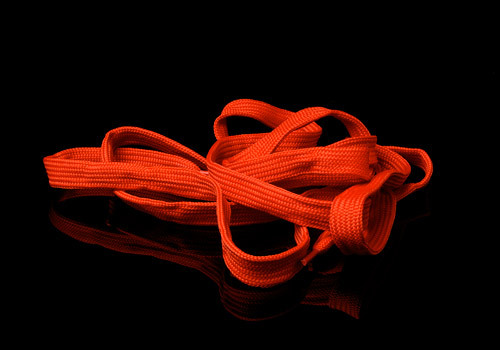 Follow those likely early ’90s productions towards the end of the decade to some robust, colorful, and clearly quite proud pairs from 1998, such as the Brazilian-hued green and yellow, and even more elegant red and gold Suedes. 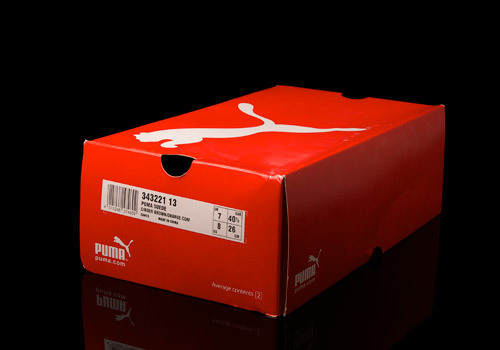 Moving forward still, more modern versions such as the 2002 navy and “ray” yellow pair, and even further forward the ever-so-slightly more futuristic PUMA Suede Classic (from 2010) and Suede Classic Eco (from 2011). Now that’s barely a brief examination of the Suede’s history (and our friends over at Forever Fresh would likely shake their heads in a state of serious depression at us calling this a ‘history’) but even digging through that small sampling one can begin to see trends and transitions. It doesn’t take a rock scientist (or a sneaker historian, for that matter) to recognize that, yes, over time, the Suede is slowly shifting and changing into something new, something more modernized. However the speed at which this is occurring is what keeps us all sleeping soundly at night; see, there’s no sign of us losing the Suede we love. 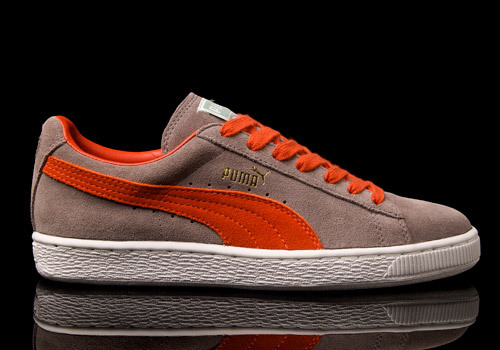 We’re secure in knowing that PUMA truly hasn’t forgotten what makes the Suede silhouette so damn nice: simple shape, gorgeous colors, and quality materials. No frills, no bells, and definitely no whistles. 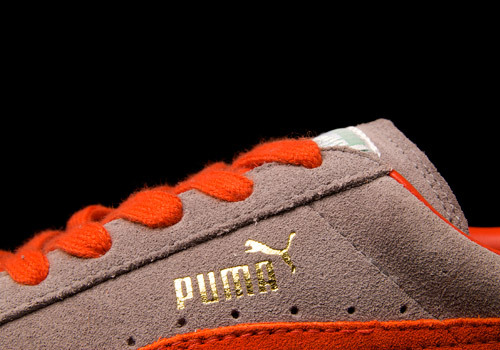 Thank you PUMA, we gladly share another Suede stored away in our archive in tribute to your long-standing legacy and dedication to ‘keeping it real’. It’s obvious to us that throughout the years you’ve never given up on one of your greatest creations yet. Now if you’d only bring those lovely green boxes back we’d all be living in a waking dream!